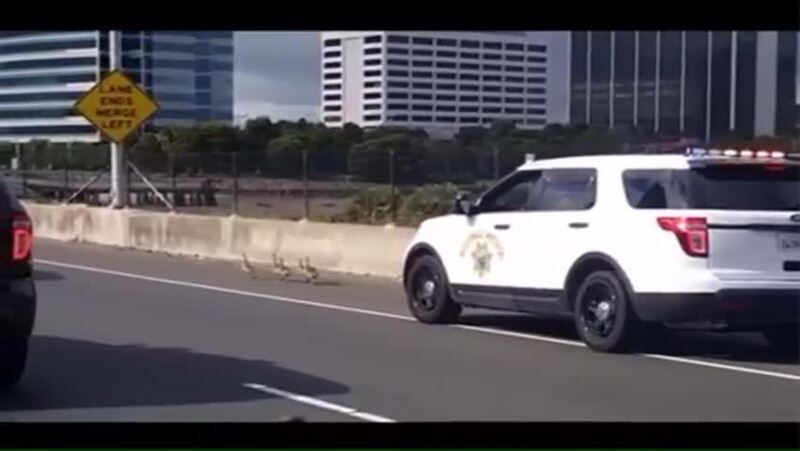 In what may be the cutest pursuit since CHP chased down a small dog on the San Francisco – Oakland Bay Bridge last month, California Highway Patrol officers were called to help corral a gaggle of wayward geese on a Bay Area highway Sunday morning. CHP officers responded after receiving a tip about some baby geese that had tried crossing Interstate 80 near Ashby Avenue in Berkeley, according to a Facebook post from agency's Oakland division. In what was subsequently described as "our slowest pursuit ever," CHP officers responded to the scene and began following the "felonious fowl," the tongue-in-cheek post stated. The geese were on the westbound side of the roadway's fast lane, CHP Officers Sean Wilkenfeld told the Los Angeles Times.All lanes of the 80 were blocked, and three patrol cars were called in as they attempted to remove them from the road. "Once we had them on the right hand shoulder we reopened all the other lanes and just blocked the slow lane, as we had the world's slowest police pursuit," Wilkenfeld said. "Not only did they block lanes, but it was quite the spectacle." Following a "nail biting" chase, the geese were channeled back into the bay, according to the Facebook post. The incident left "nothing but a traffic jam in their wake." The geese were not taken into custody, Wilkenfeld told the Times. CHP Oakland posted video of the chase, complete with its own theme music, the same day it took place. This was at least the second "pursuit" involving animals in the past two months in the Bay Area. In early April, CHP San Francisco officers safely removed a Chihuahua that had wandered onto the Bay Bridge.